Young peregrine falcons test their wings above Long Marine Laboratory. Photos by Nick Dunlop. Three peregrine falcons released by the UC Santa Cruz Predatory Bird Research Group are testing their wings around UCSC's Long Marine Laboratory under the watchful eyes of a group of UCSC students. Charged with monitoring the young falcons as they learn how to fly, feed themselves, and survive in the wild, the students peer through binoculars and spotting scopes and use radio-tracking equipment to keep track of the birds when they fly out of sight. Supervising the operation is Glenn Stewart, a program manager for the Santa Cruz Predatory Bird Research Group (SCPBRG). The five-week old falcons, two brothers and a sister, arrived at the SCPBRG facilities at Long Marine Lab on March 14 from an East Bay aviary where they were hatched. For the first few days, the birds lived in a "hack box," a simulated nest site mounted in a stairwell of the Center for Ocean Health Building at Long Marine Lab. Stewart and his fellow researchers opened the door of the hack box on March 17 to release the falcons. The actual release date, however, was left up to the falcons--they fledge, or fly from the nest for the first time, on their own timetable. 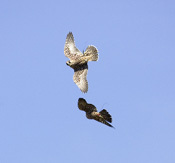 Since fledging, they have been returning to the hack box daily for meals of quail left by the researchers. A similar procedure awaits the birds expected to hatch from three eggs SCPBRG researchers rescued last week from a peregrine falcon nest on the San Francisco Bay Bridge. The rescue operation--carried out on March 30 amid a flurry of media attention--was necessary to ensure the survival of the fledglings. The bridge is an appealing nest site to adult peregrines, but it is a dangerous place for their young to fledge, Stewart said. Fledglings from bridge nests often end up drowning in the water below or being struck by cars on the bridge. At Long Marine Lab, meanwhile, the released birds in their juvenile plumage are still gawky adolescents, clumsy on their first flights and unsure how to hunt. Once they learn how to fly, their 200-mile-per-hour dives as they hunt small birds will make them the fastest creatures on the planet. Reaching that level of skill is an instinctive process, but it takes time and practice. During the first few weeks, Stewart's students mount a dusk-to-dawn watch to keep an eye on the falcons. The birds are all banded and tagged with temporary radio transmitters. Stewart shows the students how to operate the tracking equipment, but he maintains a learn-by-doing attitude toward the monitoring work. "My approach is to let the students do it," Stewart said. "It's interesting and fun for them, and it gives them that extra point on their resume that is actual wildlife conservation experience." Stewart said life for an adolescent falcon is full of dangers. Golden eagles, great horned owls, coyotes, and bobcats are all predators eager to take advantage of a falcon that hasn't quite figured out how to take off from the ground yet. Researchers watching hack boxes up in the mountains have to worry about those threats, while life in the more urban environment of Long Marine Lab has its own spectrum of dangers, including dogs, cars, and people. Falcon watcher Stephanie Quihuiz, a UCSC junior majoring in environmental studies and biology, said houses and buildings are among the factors that make keeping track of the fledglings difficult. "I think keeping an eye on them is more difficult in an urban area," Quihuiz said. "The other day, Glenn pulled one out of a trash can." Stewart explains that the trash can incident happened on a rainy morning, when the falcon probably didn't know what to do with his wet feathers. When trying to land or perch on the trashcan, he lost control and fell into it. Once there, his damp plumage and the slick side of the garbage bag trapped him. "When I pulled him out, his feathers were all wet, and he smelled like a cup of coffee," Stewart said. According to Stewart, a large proportion of young falcons don't survive their first year in the wild. This was an enormous challenge for conservation biologists, including those at SCPBRG, who fought to bring falcons back from the edge of extinction in the 1970s. Now, however, falcon populations are booming. No longer on the federal Endangered Species List, they remain on the state list and are fully protected. During the population recovery effort, the UCSC group released nearly 800 captive-raised peregrine falcons into the wild. The group continues to release falcons at two sites in California every year as mitigation for potential impacts of human activities on nesting peregrine falcons and to salvage young from urban nest sites where fledgling survival is poor, as in the case of the Bay Bridge nest. The releases also provide an important opportunity for people to learn about peregrines and gain a better appreciation for the conservation of nature, Stewart said. Releasing falcons at places like Long Marine Lab, where tour groups and other visitors to the Seymour Marine Discovery Center walk by all day long, is incredibly important, said Sandra Menzel, who has monitored previous falcon releases. Menzel graduated from UCSC last year with a degree in environmental studies and continues to work with SCPBRG on peregrine falcon research projects. "If it's one kid every year who gets stoked about falcons, or raptors in general, it's worth it," she said. Apparently, it's working. One of the students who monitored the falcons this year is Sarah Carvill, a senior in environmental studies who remembers coming out to hear Stewart talk about falcons when she was only five years old. Like the other student researchers, Carvill said that getting to know the birds and being forced to spend hours quietly observing nature were the best things about the experience. "It's about getting beyond the 'magnificent birds of prey' idea and seeing them in the context of their world," Carvill said. "It's amazing to see how vulnerable and how clumsy they are, and to watch them trying to figure life out." Note to reporters: You may contact Glenn Stewart at (831) 459-2466 or gstewart@ucsc.edu.